Week 4 of Archaeology Live! 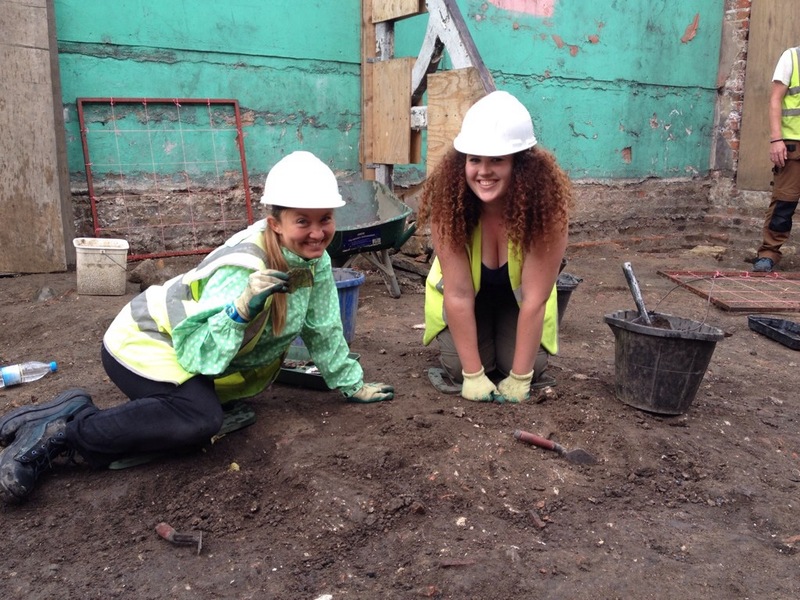 2014 saw us one third through the summer excavation. Time does indeed fly! As is becoming something of a theme, this week saw the team working with almost constant sunshine and birdsong. 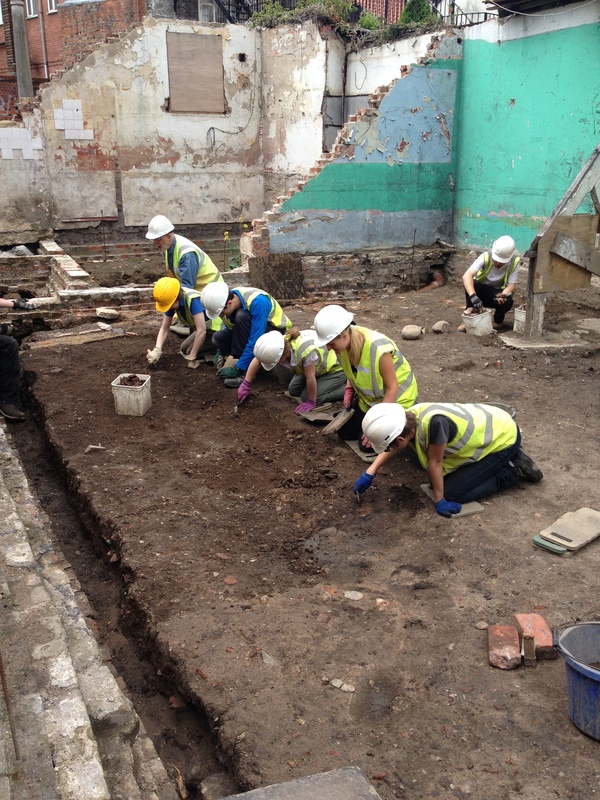 The week also saw us reach something of a benchmark as work across the whole trench was now focused on archaeology pre-dating the Victorian boxing club. 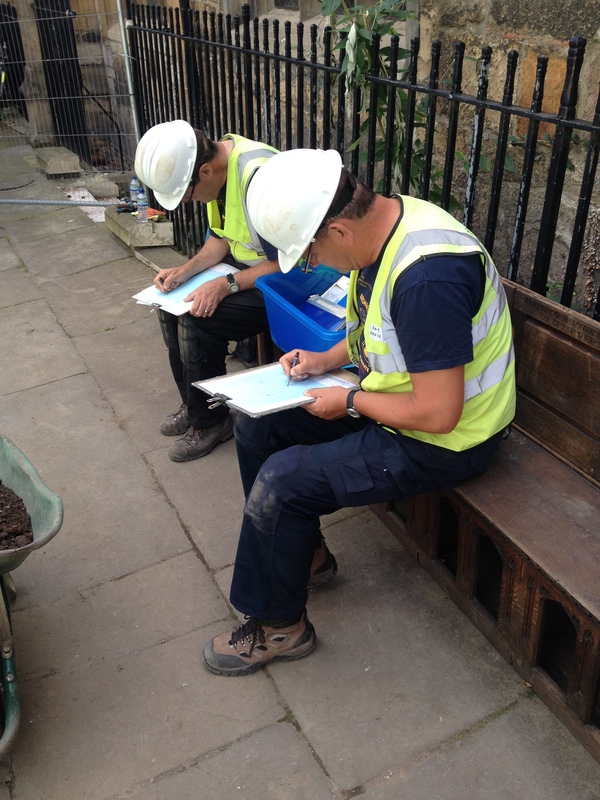 Our trainees have taken the trench back in time to the turn of the 19th century and gained a detailed understanding of the site’s Victorian past. Toby’s team peeling away construction trample layers. If one word could define this week it would be trample, as archaeologists on both sides of the trench made a concerted effort to remove the remaining areas of the trample deposit laid down by Victorian builders preparing to erect the boxing club. Compacted by nature, this deposit has made for some sore wrists, but the finds recovered from it have proved an ample reward! The 19th century builders were certainly not a tidy lot and churned up a great deal of earlier material during their work. In Toby’s end, this resulted in a very exciting discovery! While a specialist eye will be required to confirm the precise date, a fragment of a possibly prehistoric worked stone object was recovered. A fragment of a worked stone object. 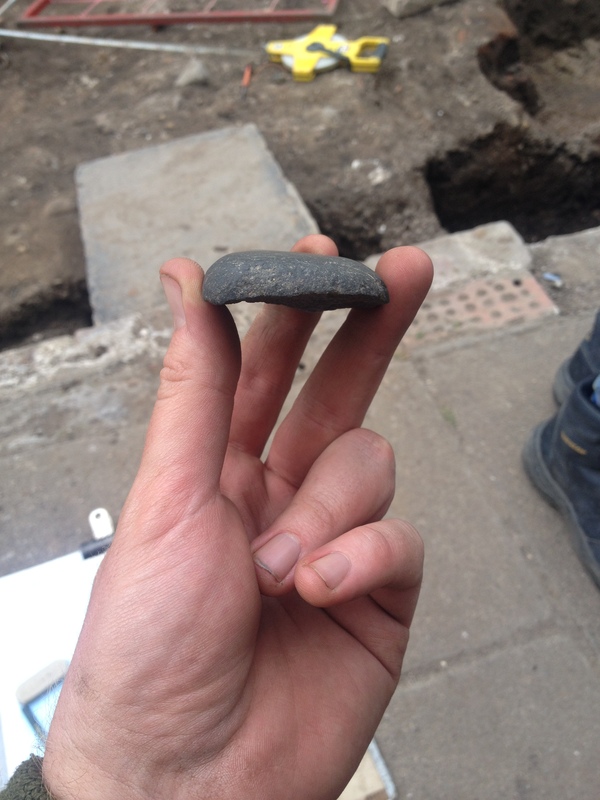 Judging by the size, shape and type of stone used, the team suspect this to be a neolithic stone axe-head, something which would have been highly prized in its time! 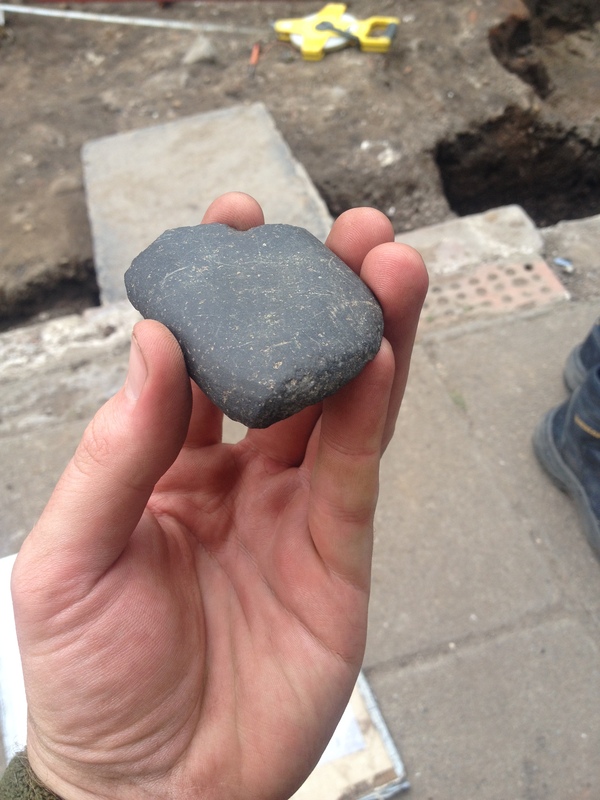 While it was found re-deposited in a 19th century context, it adds to a growing body of prehistoric artefacts unearthed in central York. 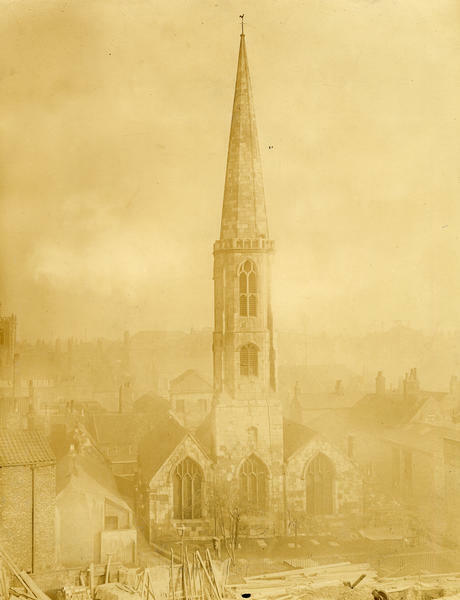 Could York have been occupied prior to the Roman invasion? Finds such as this certainly add some weight to this exciting possibility. A somewhat more recent discovery in the trample layer was a sizeable animal burrow, most likely created by an suitably industrious Victorian rabbit. This explained why new trainee Minty’s area hadn’t been making a lot of sense until that point! 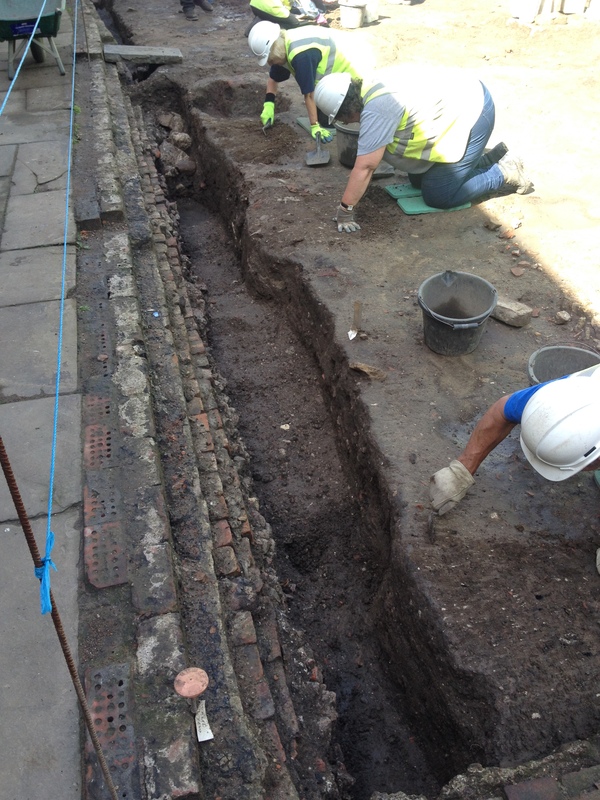 The removal of the trample layer at the south-west end of the trench exposed yet more of the 18th century rectory that occupied the site before the boxing club. Still standing on the 1852 OS map, this structure was cleared in the 1860s. Despite later truncation, the remains of this building are proving to be surprisingly extensive. Recording 18th century rectory walls. 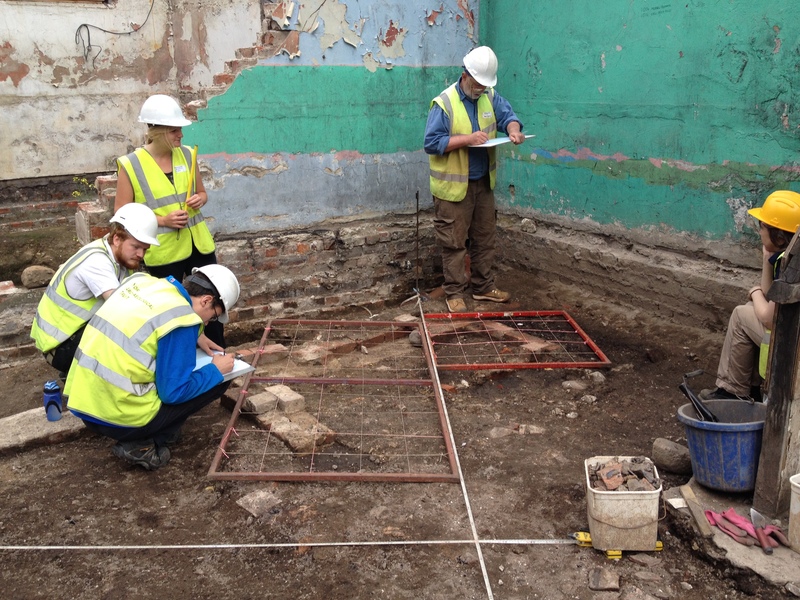 Close to the edge of the trench, Toby’s team have uncovered wall footings that may relate to additional structures such as chimneys, cesspits, etc. 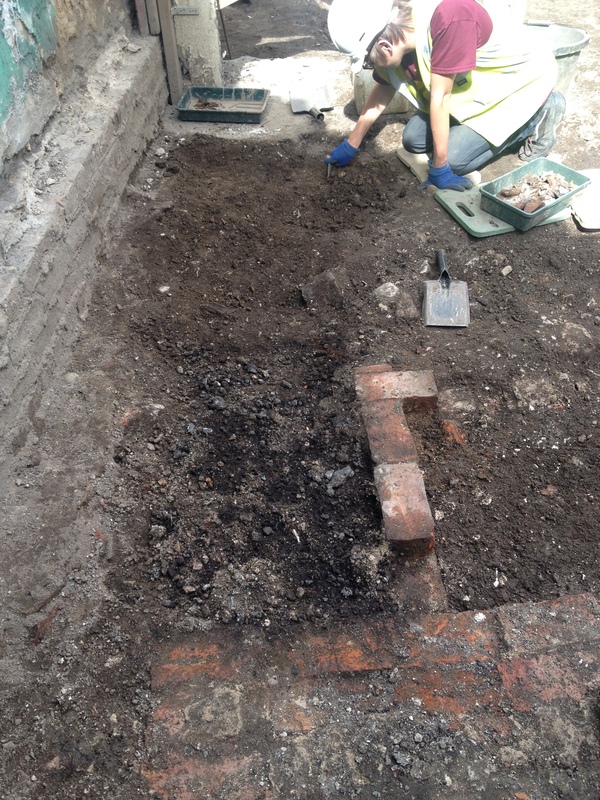 While the purpose of these structural elements is still being investigated, the presence of a deposit of ash and clinker could suggest we have discovered part of a chimney/fireplace. Excitingly, it seems that deposits relating to the use of the building survive in some quantity. As these are investigated, we hope to discover clues as to what was happening in the early-modern rectory. It was a particular pleasure this week to welcome back Archaeology Live! legends Clive and Juliet who have worked with us on each of our fourteen training digs! Jack exposing use deposits relating to the 18th century rectory. Note the dark deposit in the foreground. Team This End made some other exciting discoveries during week 4. 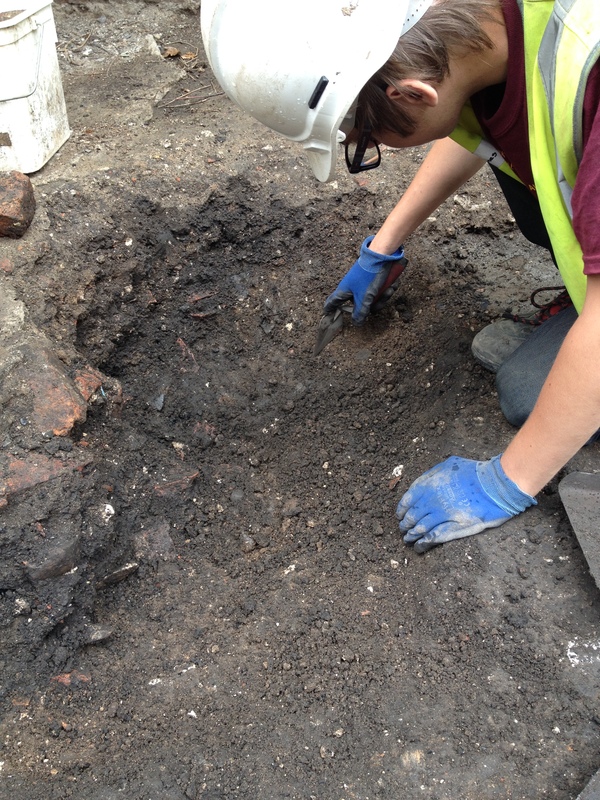 Beneath the trample layer, Jack and Louise came across a small refuse pit dating to the mid-19th century. It contained a huge amount of pottery, some with identifiable stamps and some memorable designs. 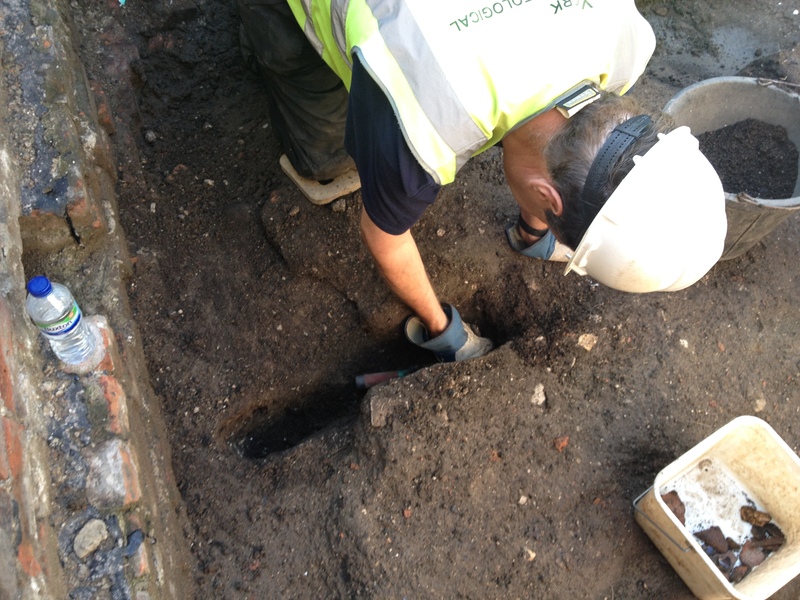 Jack and Louise’s C19th refuse pit under excavation. More unusual artefacts recovered from this context included a curious copper alloy disc with a floral decoration and a clasp from a corset. The finds from this pit date from the same period as the later use of the rectory buildings, perhaps these objects once belonged to the Rector himself! An unusual copper alloy object. Over in That End, Arran’s team were equally busy. In the centre of the trench, more of our seemingly endless trample layer was removed exposing a confusing mass of interlacing edges. This is the kind of complex archaeology that we love at Archaeology Live! It gives our trainees a chance to test their new skills on some genuinely challenging contexts. Kate and Becky working on the last remnants of the trample layer. Katie and George spent Monday and Tuesday attempting to isolate the latest of the many features revealed beneath the trample. Establishing the order archaeological events occurred in is a crucial element of single context archaeology. We begin with the latest feature and travel back in time as we dig – a process that can be quite the challenge! George and Katie begin work on their pit. 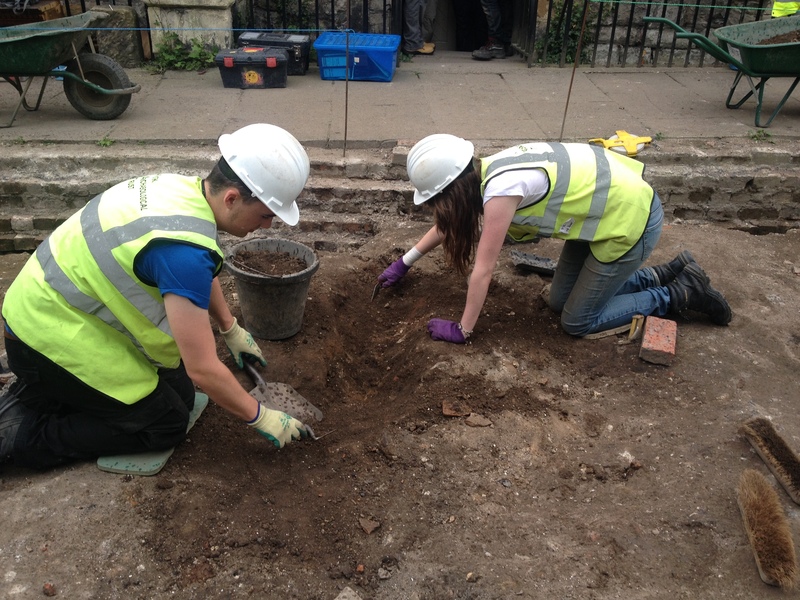 In this case, persistence paid off and Katie and George exposed a refuse pit dating to the 18th century. This appears to be the last of a sequence of inter-cutting pits that will be investigated in the coming weeks. 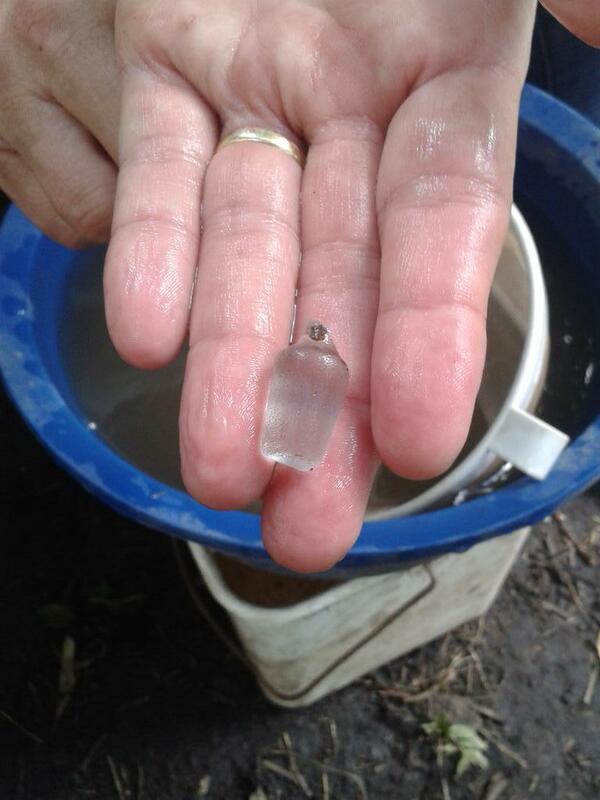 Like many deposits we have encountered, the pit backfill contained finds ranging in date from Roman to 18th century. 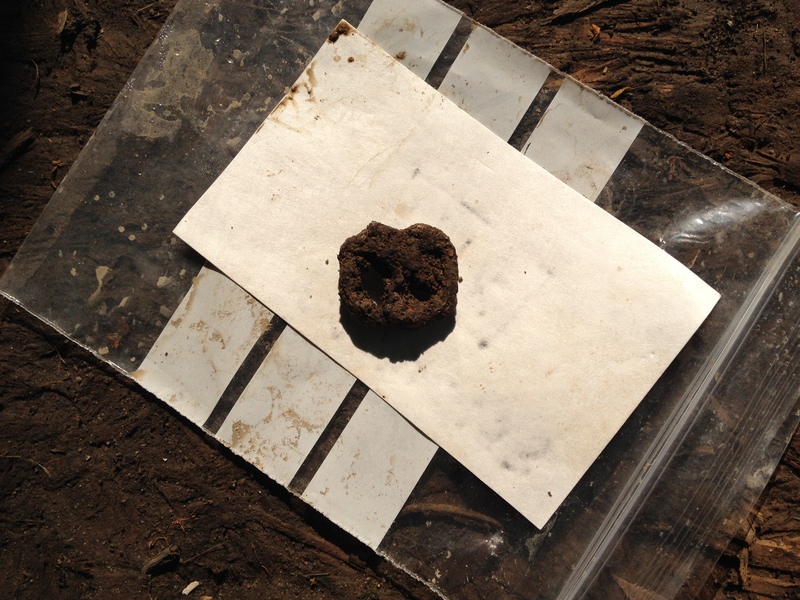 Finds highlights included a rather smart copper alloy button, a fragment of glazed medieval roof tile, stamped clay tobacco pipe and a small lead weight. Katie’s fantastic medieval pot lid. Close inspection reveals a flat head that has lost its ears and a curved tail. Stylised legs may be seen in the glaze of the body, we can’t wait to show this one to our medieval ceramics specialist! Elsewhere in Arran’s area, returnees Ray and Ian came back for their sixth year of York archaeology and were thrown into what is lovingly known as ‘complicated corner’! Situated at the north-east of the trench, this area contains a myriad of tips, dumps, post-holes and pits that relate to the yards marked on the 1852 map. Ray and Ian catch up on their records. Samian and a Victorian imposter! 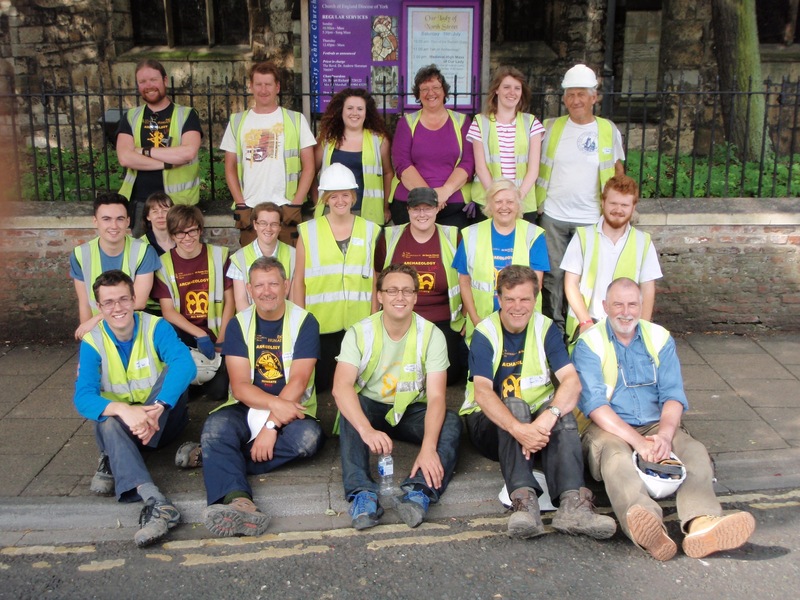 Digging in York is always a pleasure as each feature will tend to provide an interesting mix of finds, allowing people to handle artefacts of various dates and to spot clues to assist in their dating. 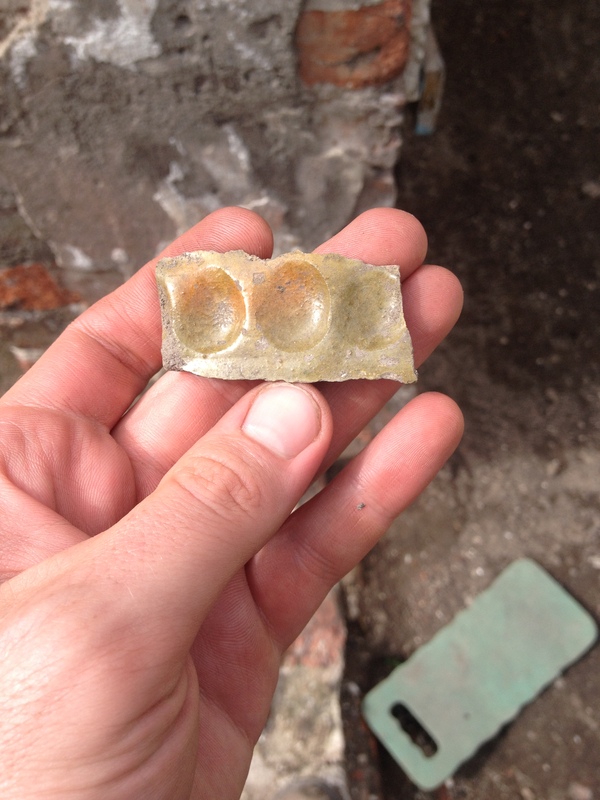 Another nice sherd from ‘complicated corner’ was this medieval piece of green glaze, complete with the potter’s fingerprints! Another interesting object from Ray and Ian’s area was this scrap of twisted lead relating to repair work on the stained glass in the 19th century. Leadwork from stained glass repair. This difficult corner of the trench is now starting to make more sense and seems to be markedly less disturbed than other areas. This will hopefully allow us to create an unbroken sequence from boxing club demolition through to the earliest deposits we reach. Ian excvating a deep, narrow cut feature. 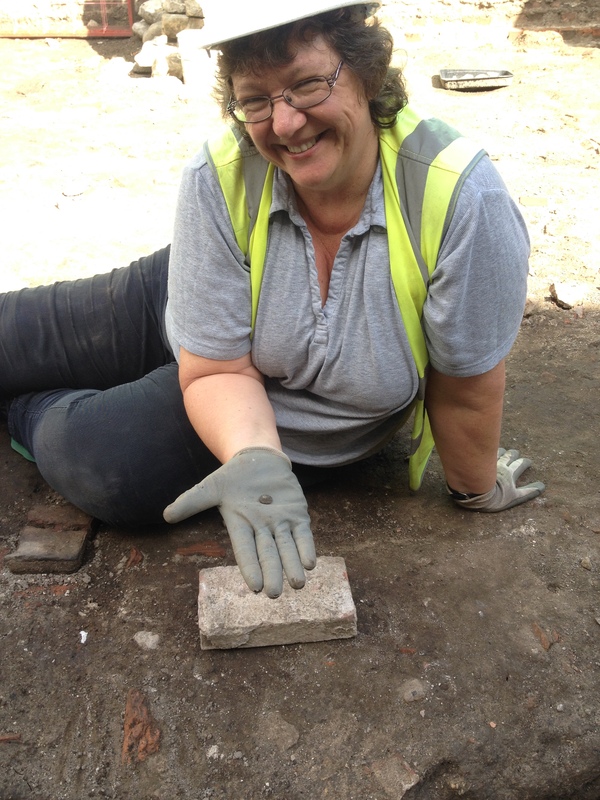 In the robber trench that we began work on in week 3, Anne was joined by fellow returnees Carol and Martin. An enigmatic feature, the cut proved to be quite deep, with some sizeable pieces of worked limestone appearing in the backfill. Anne, Martin and Carol cleaning their robber trench. 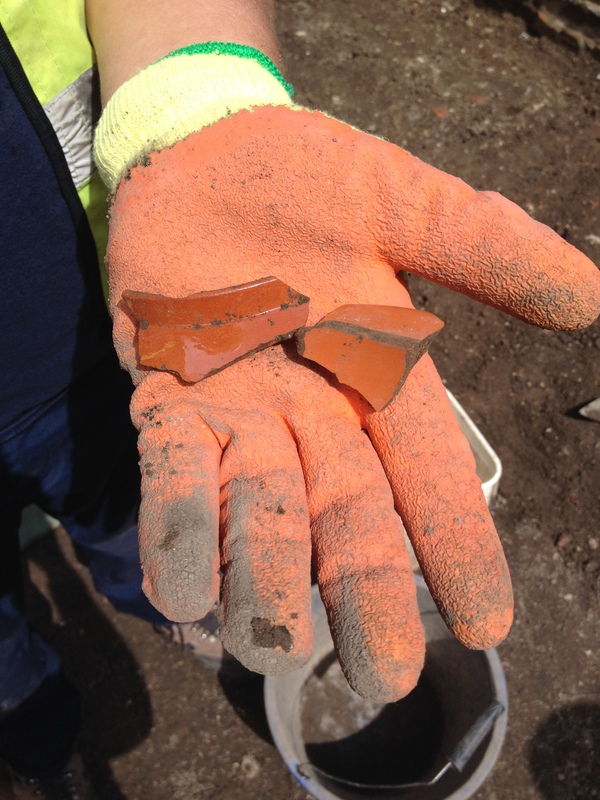 The backfill of the feature contained a good amount of medieval to 19th century pottery and a particular concentration of disarticulated human bone. 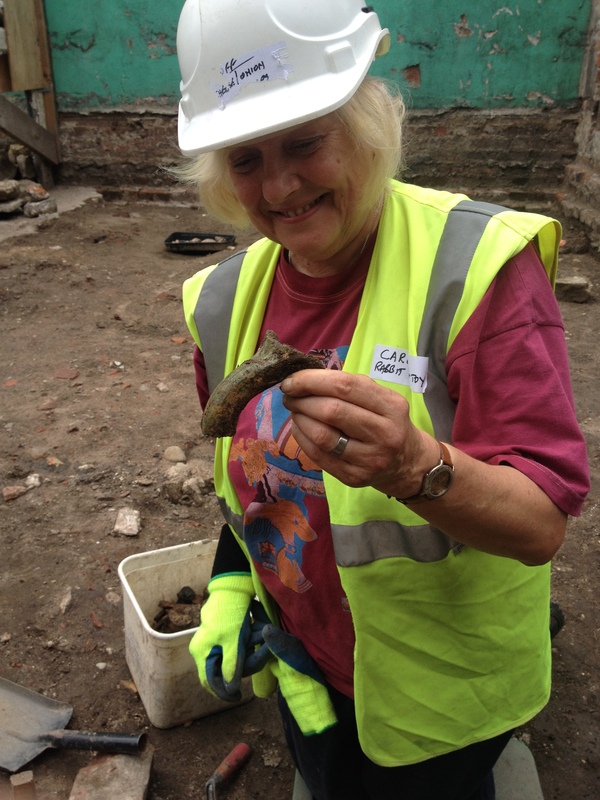 Carol showing off a medieval jug handle. As the base of the cut was cleaned, the team revealed a number of in-situ burials, something that raises interesting possibilities. 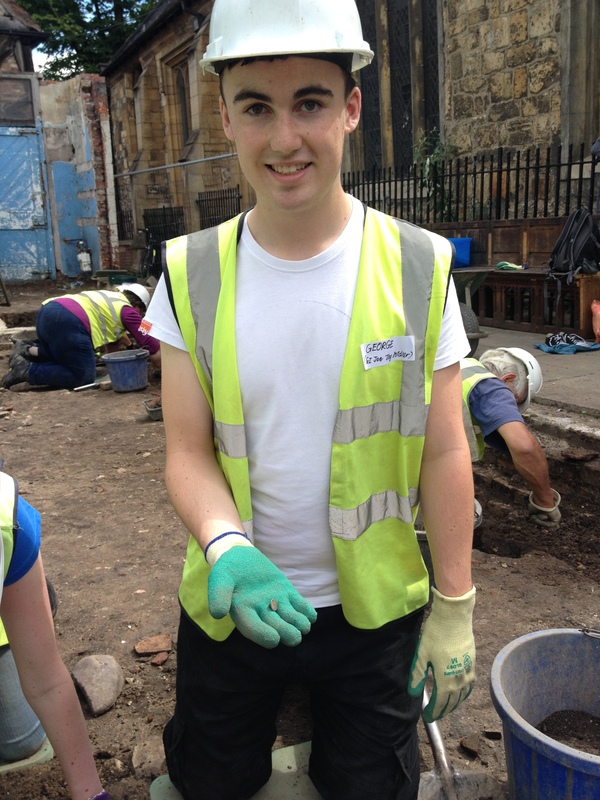 While we will not be excavating any burials, it is important that we locate and record any that lie within our trench. This will inform any future building work of areas to avoid while also answering the question of whether or not this area has been used as part of All Saints’ graveyard. Quite what was happening in this area in the middle ages is little understood and it will be fantastic to shed some light on activity during this period. 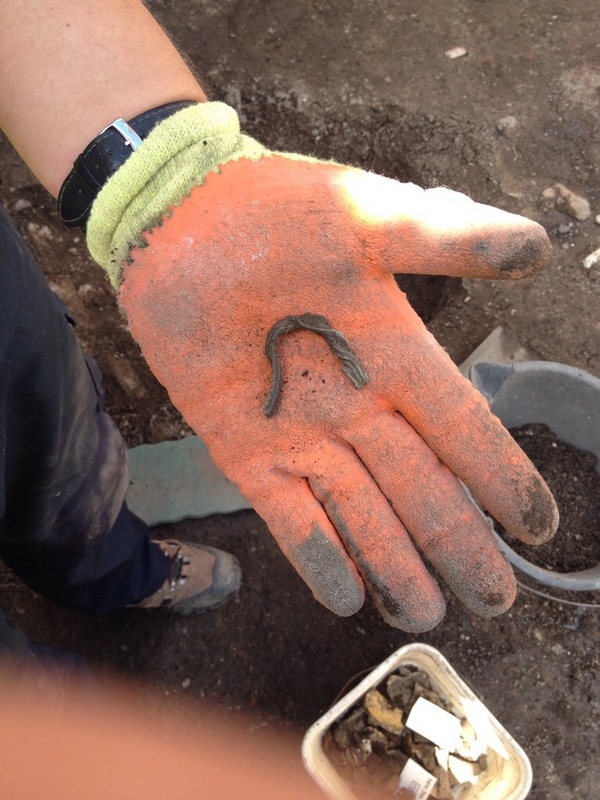 Other finds highlights from this feature included corroded remains of coffin furniture, a small ferrous buckle and our second Roman coin of the season. 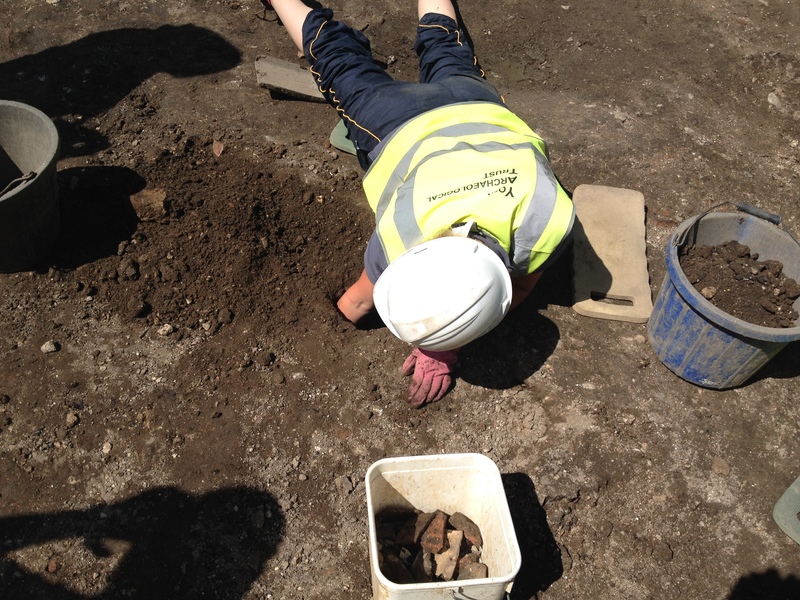 Under the ‘Tree of Finds’, Gary and his team were working flat out to keep up with the volume of finds pouring from the trench. The sun was fierce at points this week, making it a pleasant respite to wash some finds in the shade. 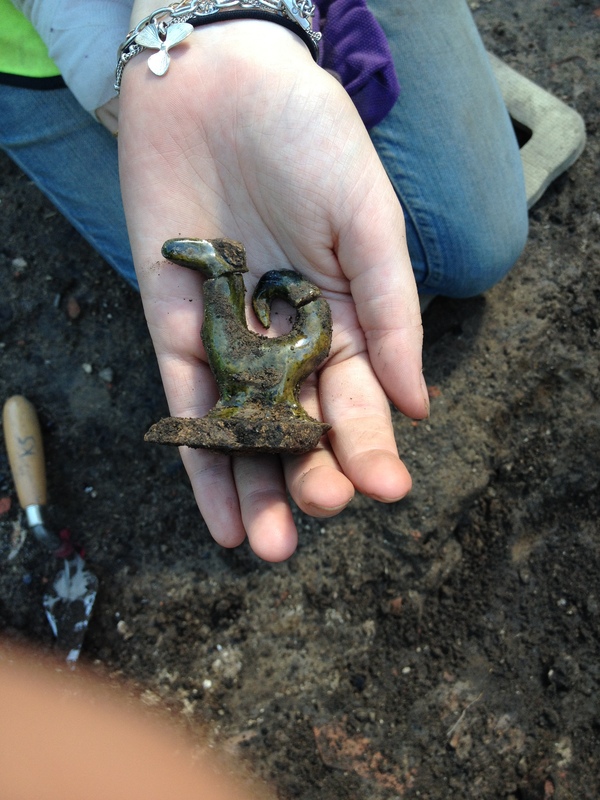 As ever, numerous points of interest were revealed as the finds were cleaned up. Finds washing in the shade of the Tree of Finds. 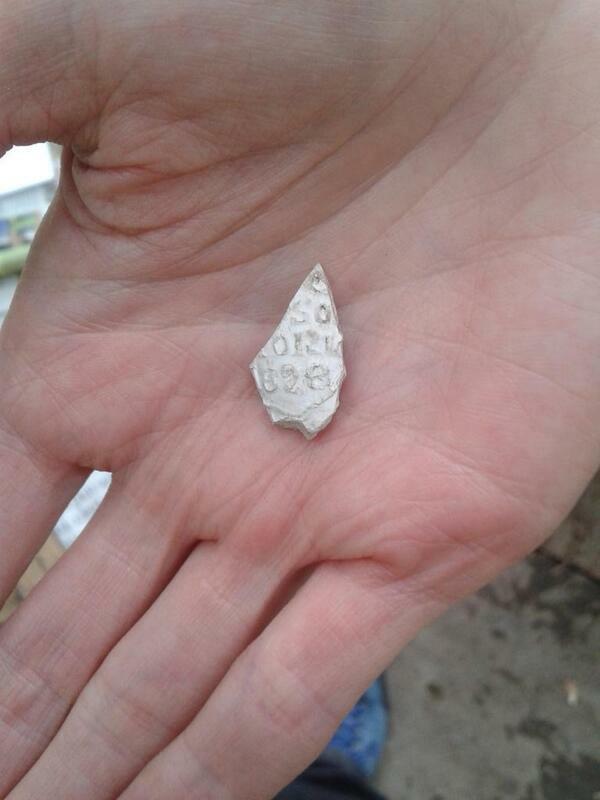 A pipe bowl fragment marked ‘York 1828’ was an unusual example of a find kindly letting us know its provenance! 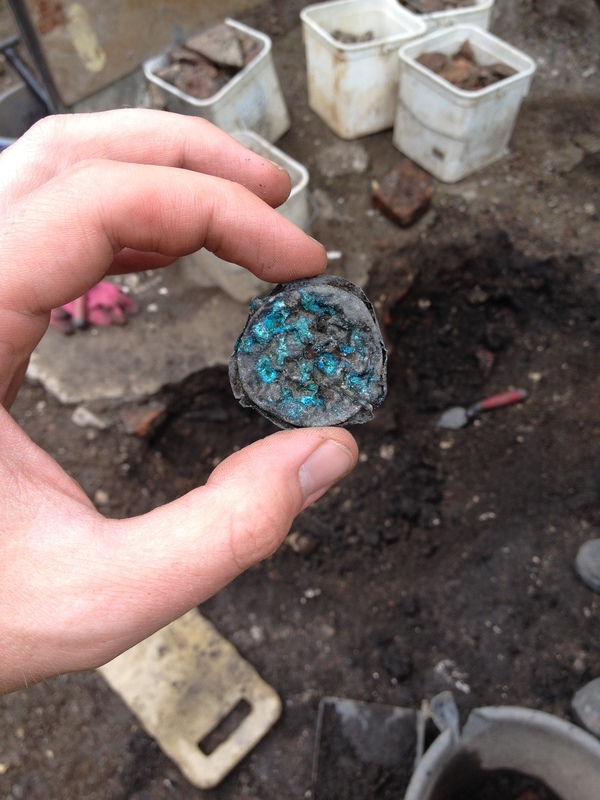 A small glass stopper appeared amidst a mass of 19th century pot sherds. 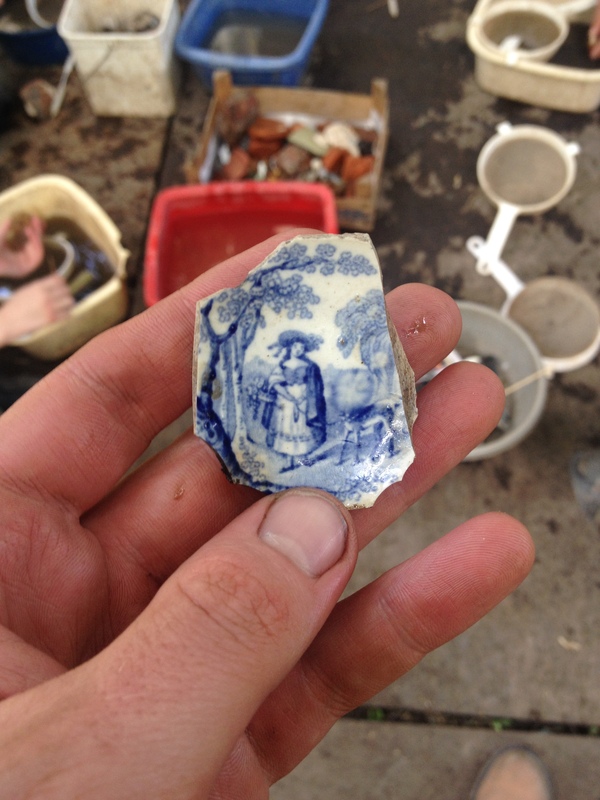 Finally, a sherd of transfer ware was washed that depicted a woman stood beside a deer on a leash. This is a trifle odd to begin with but worsens as you notice that the deer’s head appears to have exploded. While this is was clearly a fault during the pot’s manufacture, it did raise a few laughs! Taking a closer look at the finds gives the team a chance to voice theories about the nature of the deposits they have been investigating, a lot of good ideas and interpretations emerge from the Finds Tree! 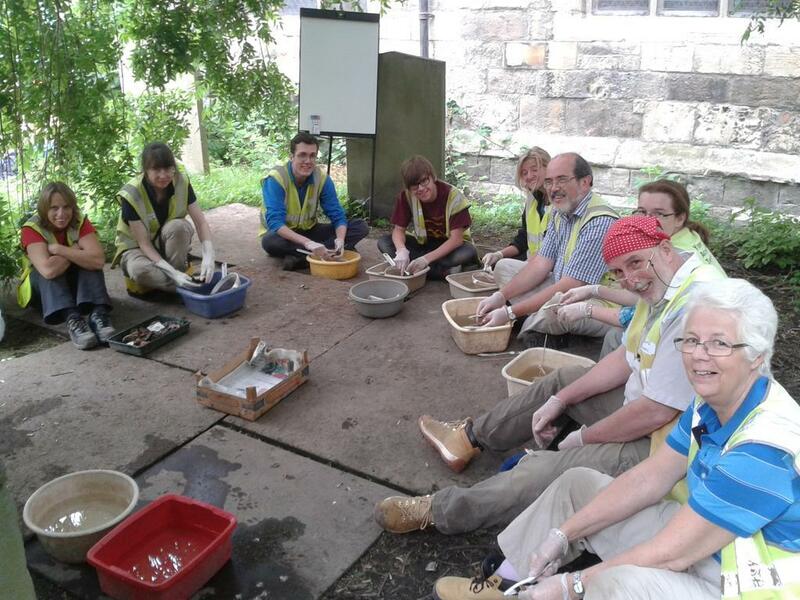 Later in the week, Gary and Tess reprised their masterclass on animal bone identification and the trainees enjoyed a tour of the YAT conservation lab and talks on ceramics and stratigraphy. The week wound up with the Friday site tour, where the team get to look at what has been happening elsewhere in the trench. After looking closely at individual features, it is always good to see these features in their broader context. Toby explaining the week’s findings in This End. Week 4 was an important week for Archaeology Live! 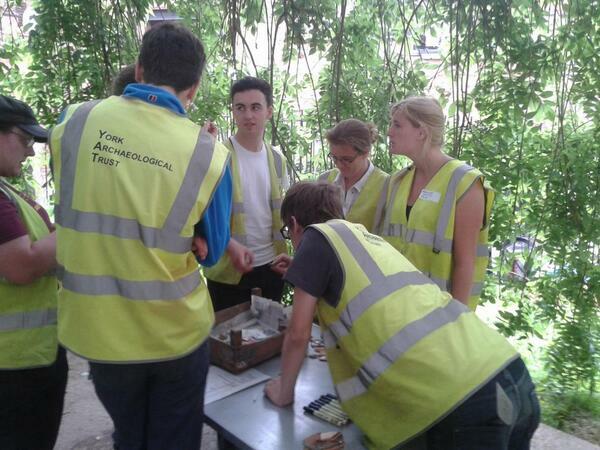 as the team really began to get to grips with archaeology of greater antiquity. With the boxing club recorded, we are now looking more closely at the rectory and yards marked on the 1852 OS and learning how the site developed between the post-medieval and Victorian periods. The week 4 team were a perfect mix of returnees and new additions and once again did some great work despite the hot conditions! 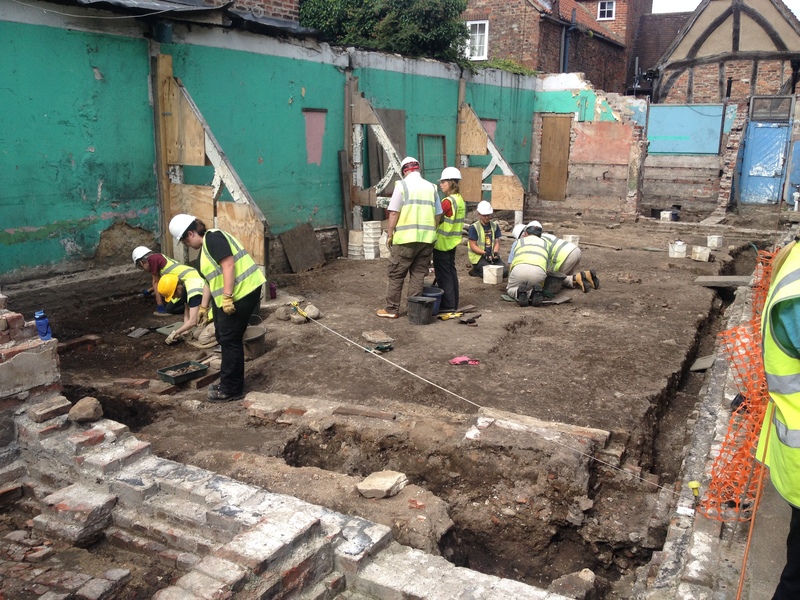 With the groundwork firmly set, we will now continue to delve deeper into the past of this fascinating little trench! 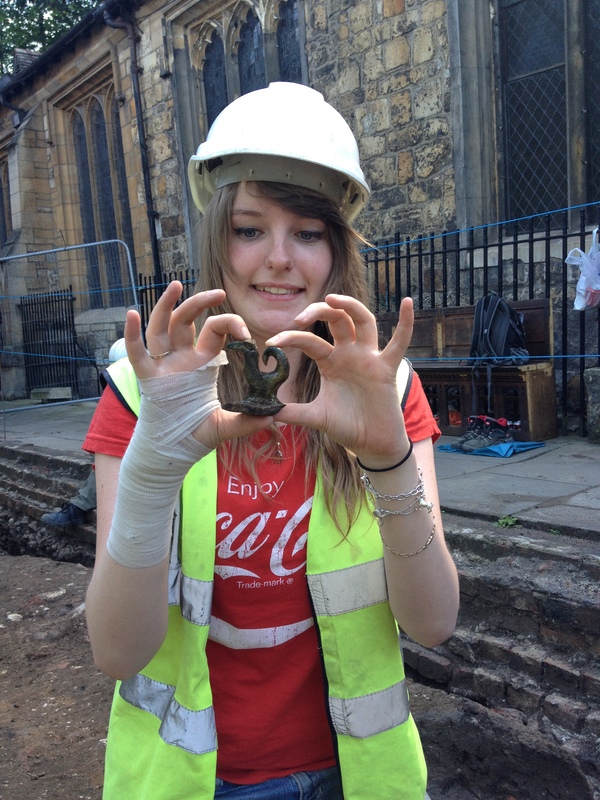 Thank you to all the trainees and placements for another busy week of exciting discoveries! 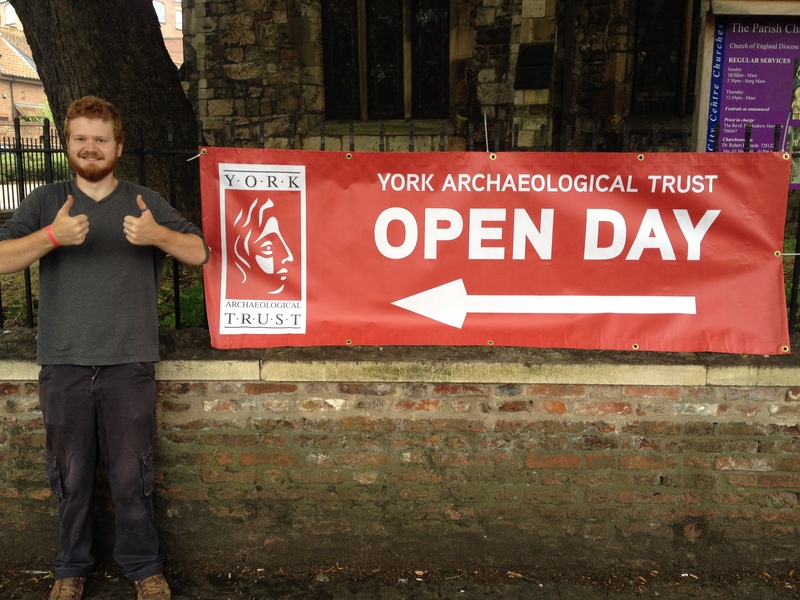 To celebrate the Festival of Archaeology on Saturday, Gary, Gus and Arran opened up the site to members of the public. 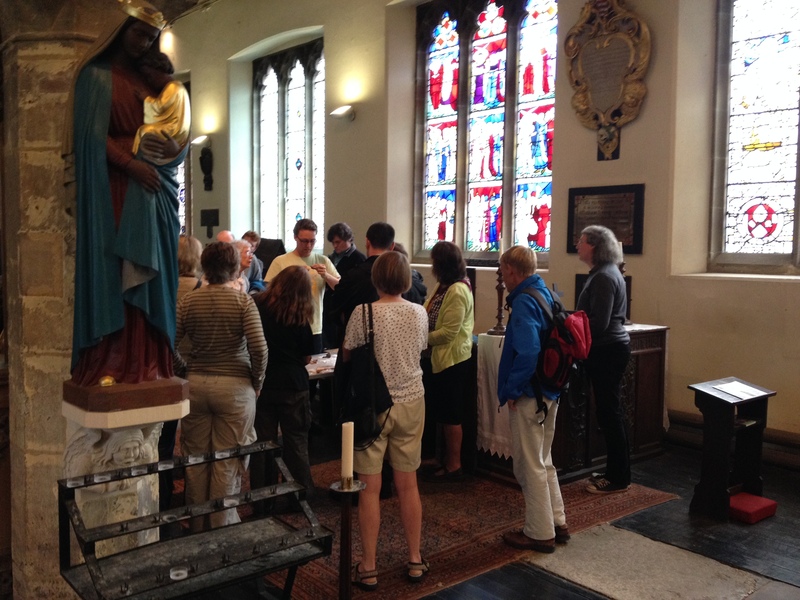 Robert Richards, All Saints church warden, led tours of the stained glass, the history of the church and the medieval tile while Gary showed off the latest finds from the trench. 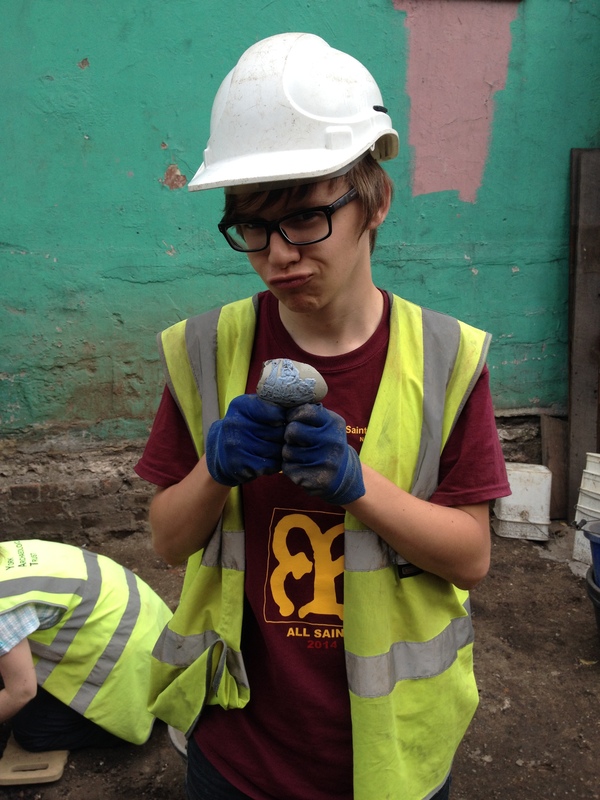 Outside, Gus and Arran showed people around the excavation and explained our latest theories and features. Gary’s finds talks proved very popular! Despite driving rain (finally!) a good number of visitors joined us, our favourite being a very bright six year old with all the makings of a future archaeologist! 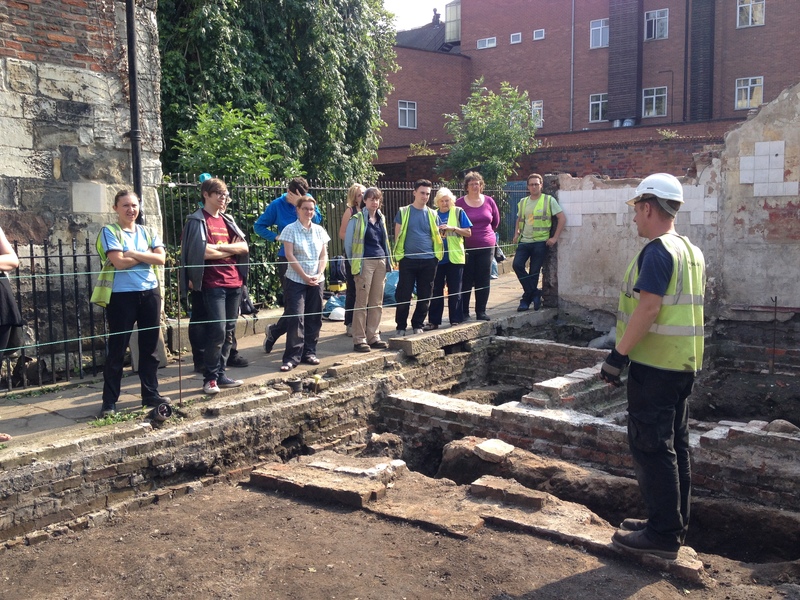 It’s always a pleasure to present our sites to the public and we hope to do several more such open days during the All Saints dig. Gus declares the site open to all! So, we’re one third through the summer and it really feels like we’ve stepped up a gear. The finds keep coming and the sequence is wonderfully complicated. Long may it continue! Until next week, onwards and downwards!! PS. An honourable mention to Jack who went above and beyond when I asked him to pose with his find and look pleased with himself! Ladies and gentlemen, Jack Pestell. Archaeology Live! Summer 2014. Week 3.